Thank you for offering to "help" me choose my makeup. In the aisle at CVS. Not while I was voluntarily sitting in a chair, with lighted mirrors, at the makeup counter of my local department store. With a professional "professional". I appreciate your offer. Truly. When I look at you and at first glance all I can see is your streaky red and blonde hair and your pancaked makeup-ed face and your raccoon mascara'd eyes? And you're probably about mid 50's but dressed like you're 17? I'm thinking I kinda don't really wanna take your advice. No offense, of course. So as I'm standing there and "mmhmmm"ing with my back turned slightly towards you? That is really not an invitation for you to proceed as if you're my own personal Bobbi Brown. ESPECIALLY when you're insisting that I need to buy PURPLE eyeshadow and CORAL lipstick. What, you don't think pink and purple would be a nice touch? She must've been thinking that you CLEARLY have no style. Or... imagination. What? Those aren't the new spring colors? What? You don't think that looks good? Remember that part in the Good Girl where Zoey D. is like, "this is called Cirque De Face. It means 'Circus of the Face." My husband thinks if I apply even the finest line of eyeliner that I've gone "Goth". It drives me crazy. He says Goth. 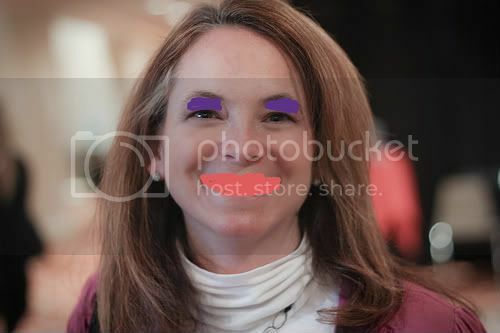 Maybe instead of the People of Walmart site (http://www.peopleofwalmart.com/) we could start a crazy drugstore cosmetic lady site. :) I've seen a few of them around here too. BTW, I love Arbonne's makeup. The cleanse may have sucked, but their cosmetics are good. so purty. wish i could have me some cosmedics like that. Dude, the CVS lady is NEVER supposed to give out makeup advice. Even if she IS the makeup lady. Hope no one hates me for saying that. Whatever. It's mostly true, right?? Definitely need some serious frostage on your hair for that palette.